We can’t make this stuff up folks (if we could we’d be out there doing it!). 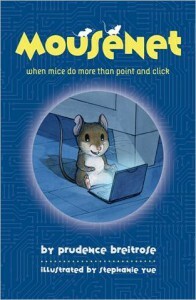 Here’s the publisher’s description of Mousenet, the first novel by Prudence Breitrose: “When ten-year-old Megan helps her uncle invent the Thumbtop, the world’s smallest computer, mice are overjoyed, and they want one for every mouse hole. The Big Cheese, leader of the Mouse Nation, has orders: follow that girl—even if it means high-tailing it to Megan’s new home on the other side of the country. While Megan struggles as the new girl, the mice watch, waiting for their chance. But when they tell Megan the biggest secret in the history of the world—mice have evolved, and they need her help—she isn’t sure anyone will believe her. With all of Mouse Nation behind her, Megan could become the most powerful girl alive, but just how will she create a Thumptop for every mouse?” It’s illustrated throughout by Stephanie Yue, and it’s available in hardcover (at Amazon and everywhere else) from Hyperion Books.